In turn, Keyes looked up to his good friend Patton and viewed him as the military genius of their age. The intimacy between Patton and Keyes allowed Patton to confide in Keyes about his secrets. When Patton first received his commission for a General, Geoffrey Keyes worked as his chief of staff. Patton struggled to organize his division and credited Geoffrey Keyes for any triumphs. "I must admit that but for his [Keyes] assistance I would probably be unable to run this job," Patton said. Keyes took temporary control over the I Armored Corps in French Morrocco when Patton travelled to Tunisia to command the II Corps located there. Patton left Keyes to plan the invasion of Sicily, which Patton would head once he returned. Patton's army seized Palermo on July 22nd, 1943. 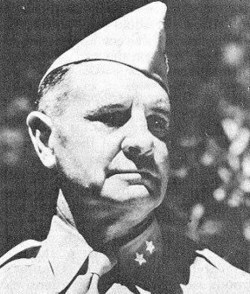 Patton described the meticulous and dedicated efforts it took to implement the maneuver of his tanks, necessary for the victory. He commends Keyes for its execution. "I feel that the future students of the Command and General Staff School will study the campaign of Palermo as a classic example of the use of tanks," Patton said. "Such methods assure victory and reduce losses, but it takes fine leadership to insure the execution. General Keyes provided perfect leadership and great drive. The praise should be his." In a letter, Patton conveys the excellent leadership Keyes demonstrated that day. "I believe," Patton writes. "That historical research will reveal that General Keyes' Corps moved faster against heavier resistance and over worse roads than did the Germans during their famous blitz." Patton even extended his praise for Keyes in another letter, this one addressed to Eisenhower. "The performance of all the troops, infantry and armored, was outstanding, and the drive and leadership shown by General Keyes were of a superior order," Patton said. "I should appreciate it if his name could be released [to the press]." In fact, Keyes did receive national press attention for his attack. A LIFE Magazine article titled Surrender of Palermo published on August 23rd, 1943 devoted four pages to the attack on Palermo. A quote from Patton at the end called Keyes' victory "the greatest blitz in history." Later on, Eisenhower's personal assistant, Everett Hughes, arrived in London. Eisenhower had instructed him to find a replacement for Hobart Gay, Patton's chief of staff. Hughes debated among many candidates for this job, but one stood out in his mind. "Of course if something should happen to make Keyes available," Hughes writes in his diary. "I will take him like a shot." In October of 1945, a reporter John O'Donnell published a column "Capitol Stuff". The column mentioned that General Patton had slapped one of his soldiers and called him a "yellow-bellied" or "yellow-streaked" Jew. Upon further investigation, O'Donnell determined that the soldier had Jewish heritage and referred to Patton as a "scapegoat" in his article. The New York Daily News published O'Donnell's column on October 3rd. Patton wrote many letters denying this incident. Finally on October 16th, Keyes paid him a visit. "General Keyes flew up from Heidelberg to see me," Patton writes in his diary. "I think his sole reason was to express in a very refined manner, as is always the case with him, sympathy. I was delighted to see hi as I think he is one of the pleasantest companions and most loyal friends I have ever known." In December of that year, the incident still had not cleared up. 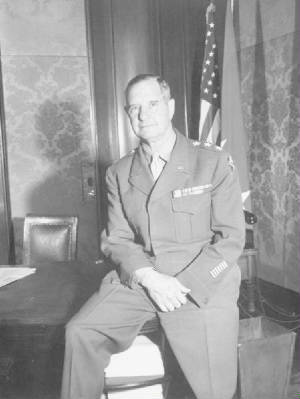 Keyes wrote to his wife that he would spend one last night with the general before Patton went away. "He [Patton] was leaving Monday on his way home for Christmas," Keyes writes. "Yesterday morning after breakfast I started home, and he and Hap Gay were to start for Mannheim...in a few minutes to go hunting...I didn't get home until after 1 PM, when I should have been here by 11 AM. As soon as I arrived, I was told of the accident." While driving to the hunting grounds, two large trucks crashed into Patton's car. One of the passengers in the car, Horace L. Woodring, recalls the crash. "The General [Patton] was thrown forward and hit his head on the railing above the rear of the driver's seat," Woodring recalls. "It took all the skin from the General's forehead for approximately three inches above his eyebrows and three inches across, partially scalping him and completely separating his spinal column." As soon as Keyes heard about the accident, he left immediately for the hospital and spent the rest of the day there. He voiced his concern about Patton in a letter to his wife that day. Keyes who couldn't bear the thought that he wouldn't make it through. In a later letter to his wife, he declared that the doctors believed that he would get better despite Patton's worsening condition. Keyes' devotion led him to hold onto the hope that his long-time friend would recover. Keyes wrote frequent letters to his wife updating her on Patton's condition. As Patton's condition worsened, all but a few select group of friends were allowed to see him. Keyes was among them. Keyes and Patton's wife, Beatrice Patton remained convinced that the General would recover. However, on December 21, 1945 General Patton died in his sleep, only five days after Keyes had informed his own wife of Patton's forseeable recovery. Keyes morned the death of his friend and attended the funeral along with Beatrice. Keyes wrote and signed the General Orders announcing Patton's death. It was a great loss to him. In his own words, "The Seventh Army has lost a great friend, a gallant warrior, and [an] inspiring leader." Keyes retired in 1954 and received a personal letter from President Truman thanking him for his service to his country. He finally died on September 17th, 1967. His body is buried at West Point. Notes: Keyes headed the Provisional Corps consisting of the 82d Airborne, 2d Armored, and 3d Infantry Divisions. Patton put Keyes in charge of this. The Provisional Corps destroyed all the Italians in their path. LIFE Magazine leading photograph from article titled Surrender of Palermo published on August 23rd, 1943.